Cassettes are designed with an innovative micromesh chamber to securely retain fragments, leaving substantial room for additional, larger specimens. This 0.23mm micromesh chamber provides effective fluid exchange and eliminates the need for additional filters. The durable acetyl polymer construction is resistant to the chemical action of histology agents. 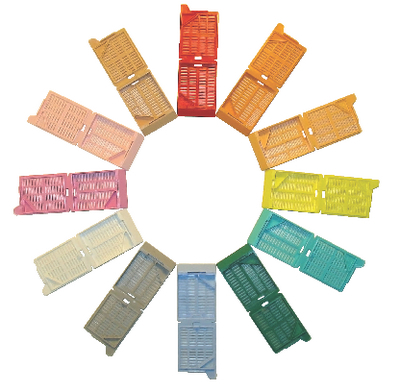 Cassettes snap open or shut easily and feature a 45° angled writing surface that is suitable for use with most labeling devices. Available in 13 non-metallic colors. Non-cytotoxic. Ordering information: Cassettes are packaged 500 per dispenser box, 3 boxes per case.